So I am new to Follow and Feature Friday but it is a blog hop hosted by Parajunkee View and Alison Can Read. Basically it is a way to gather followers and to check out some really cool book blogs. If you are interested in participating head on over to Parajunkee View or to Alison Can Read. The question for this Friday is: What Superhero is your alter-ego? If you follow me please leave a comment on this post saying hi with a link to your blog. So, what Superhero is your alter-ego?? She has beautiful hair! Great answer. Thanks for stopping by Epic (Chocolate) Fantasy! Following you back! Great answer. I LOVE the X-Men. Thanks for becoming a follower of my site. I'm now following you back. Oh my gosh, I LOVE X-Men! And Rogue is one of my favourites -- I think you should definitely try out that super-cool streak thing! :) Since my choice is Kitty, we could make a pretty awesome duo! I love Rogue too. I think she might be my 2nd choice, her or Mystique. Thanks for stopping by my blog & following! Following you back. Love Rogue!!! Such a great choice! Love her hair!! Great choice!! Thanks for visiting and following...I'm following you now as well! There's lots of Rogue's out there tonight. Personally, I'd choose to be her just for the Gambit factor!! Thanks for stopping by. Am following you in return. Rogue is a great choice! Thanks for stopping by! I'm following you as well! We have the same pick! That's cool.... she's popular today! Rogue is definitely a good one! Thanks for commenting and following! I'm following back! :) Very cute blog! She sounds awesome! And love the hair. Nice!! Seeing lots of Xmen picks! Gotta see those movies now! This is the second time I've seen Rogue today! She's so awesome! Great pick! Love Rogue! And it doesn't hurt that she's a fellow Winnipeger! Thanks for stopping by :) your newest follower! Haha, I love your reasons for choosing Rogue. She really does have awesome hair. Thanks for stopping by and following! Following you back! Gotta love that white streak! LOL The association is valid too. Thanks for stopping by my blog! Following you back! I love Rogue. She is great. Thanks for following Better Read Than Dead...I followed you back. Have a great weekend. Well, as you probably saw, I couldn't think of one! I do know what kind of powers I'd like to have though! Thanks for following - I'm following back! Thank you for following and commenting! I love comments! I like Rogue :) and how can you not want to be associated with Eric Northman?! *sigh* Loves him! Ahahahahaha. I love that your thought was to be associated with Eric from True Blood, though I can hardly blame you! :) Rogue is pretty cool herself though. Thanks for stopping by my blog today, and I'm following you back now! Thanks for the follow; I'm following back. Great looking blog. Love Xmen!! She is really cool in the comics and can even fly! You picked the best choice!! 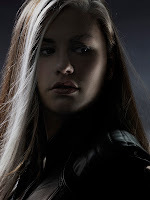 Rogue rocks, and so does her hair and her powers. New follower here, hope you have a great one. I've always loved Rogue! The X-Men keep popping up today! thx for stopping by!! Great choice!! Hopping through. New follower! A lot of people have picked Rogue. I should watch Xmen some time. That's a great choice. It's true though, it's been a popular. It's been a lot of Rogue and Storm. Where's the Wonder Woman love? I thought about choosing her, but she didn't have an awesome pinup picture like Sally Jupiter. Thanks for stopping by my blog - I'm a new follower here. I've seen Rogue on a couple of blogs today. Though I'm not familiar with X-Men, she sounds awesome! Rogue is a good choice, and I love the pics! Awesome thinking, getting in Eric's crowd :D The hair is cool, of course. Thanks for stopping by, and I just have to say, love your look xD Have an awesome weekend! Good choice and that hair is way cool. Thanks for stopping by www.clairesbookcorner.blogspot.com I'm following you too now. Thanks for stopping by my corner of the blogoverse Sarah - following you back! lol nice answer. love eric but i love bill more! thanks for stopping by my blog and im also your newest follower! Hey! Thank you for following! I followed back =) I love your choice! I love X-Men! Rogue is amazing! Great choice. Thanks for following. I'm following back. I think it is funny on mine I picked Rogue and Storm, though I heavily meant Rogue from the comics, not the Movie. I feel like the only person not to choose a superhero! thanks for being a new follower at our blog http://kcs-books.blogspot.com!! i'm a new follower as well. have a great weekend!! I didn't really know what to answer to this question. I liked wonder woman when I was younger, but I don't know. I LOVE ROGUE! Gr8 pick. My bro in law got me into those movies cuz I always thought I would dislike them. How wrong I was! lolz. Ur blog looks fab & I am def coming back l8r to check it out..
Great answer...I've always wanted hair like hers though I probably wouldn't enjoy the whole no touching thing. New follower. I KNEW there was someone I missed! Gosh, Rogue was one of my favourite superheroes (or superheroine?) when I was a huge X-men fan. She has gorgeous hair and it'd be so awesome if you could make it rain when there's a compulsory school cross-country run LOL. I didn't know who to pick this week either! But Rogue is a great choice. New follower! Thanks for coming by my blog. I love Rouge! Thank you for the follow, will be sure to follow your blog! Hahha, nice explanation. ;) I wouldn't be able to be her and not touch people normally... Otherwise she'd be awesome! I'm following back! Thanks for stopping by. Aw, how could I forget this? Rogue was my favorite in X-men cartoons (I have never watched the movie).